From the Department of Neurology (S.-J. Choi, J.A. Kim), Seoul National University Hospital; and the Departments of Neurology (Y.H. Park, S.Y. Kim), Neurosurgery (J.H. Han), and Pathology (G. Choe), Seoul National University Bundang Hospital, Seongnam, Republic of Korea. Rheumatoid meningitis is a rare complication of rheumatoid arthritis that requires a meningeal biopsy for diagnosis. Asymmetric meningeal involvement is a common, although not pathognomonic, brain MRI finding in rheumatoid meningitis. Because various immunosuppressants are used for the treatment of rheumatoid arthritis, a thorough investigation to exclude opportunistic infections should be conducted before the diagnosis of rheumatoid meningitis. Immunoglobulin G4–related disease, granulomatous diseases such as granulomatosis with polyangiitis, neurosarcoidosis, neurosyphilis, and meningeal metastasis are possible considerations in the differential diagnosis of rheumatoid meningitis. A 65-year-old woman with a 3-year history of rheumatoid arthritis presented with headache, confusion, a decreased level of consciousness, and recurrent left hemiparesis. Her rheumatoid arthritis was well-controlled with oral prednisolone, methotrexate, and leflunomide. Serum levels of rheumatoid factor and anticyclic citrullinated peptide antibody were 69.3 and 48.8 U/mL, respectively. Brain MRI revealed mild hydrocephalus and diffuse asymmetric high signal intensities with patchy nodules, which were prominent along the leptomeninges and subarachnoid space of the right frontoparietal lobe on fluid-attenuated inversion recovery (FLAIR) images and diffusion-weighted imaging (DWI). Gadolinium uptake was observed in the leptomeninges over the right hemisphere on postcontrast T1-weighted images (figure 1, A–C). The results of CSF analysis showed an opening pressure of 15 cm H2O, leukocyte count of 20/μL (54% neutrophils, 31% lymphocytes, 15% other cells), protein level of 113.4 mg/dL, and glucose level of 43 mg/dL; however, within 2 weeks, the CSF opening pressure became elevated, reaching 27 cm H2O. In addition, CSF rheumatoid factor was detected at a level of 17.6 IU/mL. An extensive workup for infectious diseases, autoimmune diseases including vasculitis, and leptomeningeal metastasis was performed. CSF cytology for malignant cells as well as Gram stain and culture were negative. Tests for Mycobacterium tuberculosis and fungus in the CSF were negative. CSF PCR results for Hemophilus influenzae, Streptococcus agalactiae, Neisseria meningitidis, Streptococcus pneumoniae, Listeria monocytogenes, herpes simplex virus, varicella-zoster virus, Epstein-Barr virus, cytomegalovirus, and enterovirus were negative. Serum levels of immunoglobulin G subclass IV (IgG4), antinuclear antibody, anti-neutrophil cytoplasmic antibodies, anti-dsDNA antibody, anti-Ro/La antibodies, and angiotensin converting enzyme were normal. The EEG results showed regional slowing in the right frontocentral region. 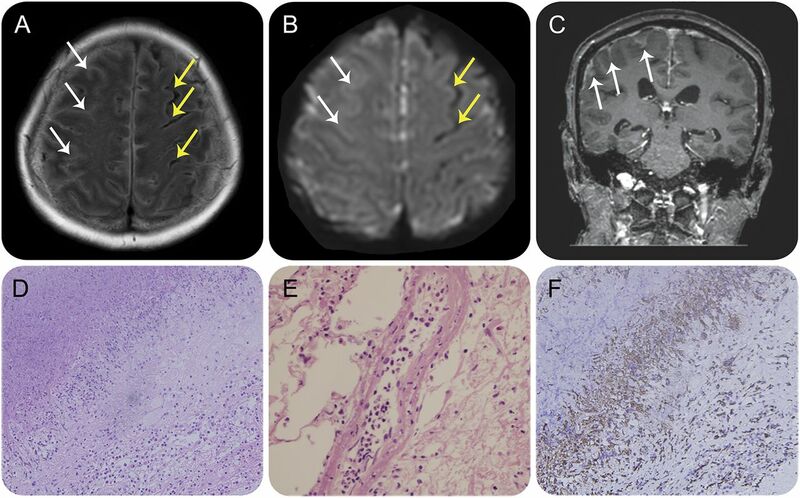 A biopsy from the right frontal meninges revealed necrotic granulomatous inflammation with dense infiltration of CD68-positive histiocytes as well as focal vasculitis in the leptomeninges (figure 1, D–F). Rheumatoid nodules were not present. In contrast to the leptomeninges, brain parenchyma and the pachymeninges were not involved (figure e-1 at Neurology.org). Acid-fast bacilli stain and culture with a nested PCR for tuberculosis in the biopsy specimen were negative. These findings were consistent with rheumatoid meningitis. The patient's left hemiparesis had started to improve with the insertion of extraventricular drainage. She was successfully restored to her premorbid functional status with high-dose IV methylprednisolone pulse therapy (1,000 mg daily for 5 days) and subsequent oral prednisolone at 60 mg daily. This patient presented a rare case of rheumatoid meningitis and demonstrated the notable MRI appearance of asymmetric leptomeningeal involvement. (A) Axial fluid-attenuated inversion recovery (FLAIR) image demonstrates diffuse high signal intensities overlying the bilateral leptomeninges and subarachnoid space, which shows asymmetric meningeal involvement, more definite in the right frontoparietal area (white arrows) than in the left side (yellow arrows). (B) Axial diffusion-weighted imaging (DWI) shows diffuse meningeal high signal intensities with patchy nodules, more prominent in the right cerebral hemisphere (white arrows) compared with the left side (yellow arrows). (C) Contrast-enhanced coronal T1-weighted image shows distinct leptomeningeal enhancement over the right frontoparietal lobe (white arrows). (D) Meningeal biopsy reveals chronic granulomatous inflammation with necrotic changes in the leptomeninges (hematoxylin & eosin staining, ×200). (E) Non-necrotizing vasculitis in medium-sized vessel with infiltration of mixed inflammatory cells (hematoxylin & eosin staining, ×400). (F) Immunostaining demonstrates infiltration of CD68-positive histiocytes surrounding granuloma (×200). In this case, the patient developed recurrent left hemiparesis during admission and showed definite asymmetry on brain MRI. Unilateral meningeal involvement in rheumatoid meningitis is not considered uncommon.1,2 Some previous cases had presented with stroke-like episodes of abrupt-onset hemiparesis.1 In contrast, relatively few cases of rheumatoid meningitis show diffuse symmetric meningeal enhancement.2 Brain MRI findings, which demonstrate unilateral meningeal thickening with high signal intensities along the adjacent subarachnoid space on FLAIR images, and bright signals on DWI are helpful to support diagnosis3,4; however, to our knowledge, the diagnostic importance of asymmetry on brain MRI in rheumatoid meningitis has not been systematically evaluated. To investigate how frequently asymmetry on brain MRI is observed in patients with rheumatoid meningitis, a systematic search of publications listed in PubMed from 2005 to 2016 was conducted using the keywords “rheumatoid” with “meningitis,” “leptomeningitis,” and “pachymeningitis.” In total, 28 case reports in English were collected. We reviewed a total of 29 patients with rheumatoid meningitis including the present case. Among them, about 62% of cases (18/29) showed definite asymmetric meningeal involvement on brain MRI. Furthermore, most patients had developed hemiparesis or hemibody sensory changes mimicking acute stroke or localization-related epilepsy in the course of the disease (table e-1). The reasons for a meningeal, rather than brain parenchymal, predilection in rheumatoid meningitis, and the pathophysiology of its asymmetric meningeal involvement, remain unclear. One possible explanation is that autoimmunity against collagen fiber, a major component of the meninges, and its contiguous spreading may play a pathogenic role. The precise mechanisms of asymmetric meningeal involvement require further investigation. Rheumatoid meningitis can be one of the important differential diagnoses in a patient with rheumatoid arthritis and asymmetric or unilateral neurologic symptoms. Although a meningeal biopsy is necessary to confirm the diagnosis, a common MRI feature of asymmetric meningeal involvement may lead to earlier diagnosis of rheumatoid meningitis. Nonetheless, an extensive evaluation to exclude opportunistic infections of the CNS must be conducted before a diagnosis is made. Seok-Jin Choi: design and conceptualization of the study, analysis and interpretation of the data, drafting and revising the manuscript. Young Ho Park: design and conceptualization of the study, analysis and interpretation of the data, revising the manuscript. Jin Ah Kim: analysis and interpretation of the data, revising the manuscript. Jung Ho Han and Gheeyoung Choe: analysis and interpretation of the data. SangYun Kim: analysis and interpretation of the data, revising the manuscript. The authors thank Drs. YoonJin Kwak and Kyu Sang Lee of the Department of Pathology at Seoul National University Bundang Hospital for comments and technical assistance in preparing the figures.
. Rheumatoid meningitis: radiologic and pathologic correlation. AJR Am J Roentgenol 2006;186:1181–1183.
. MRI with DWI helps in depicting rheumatoid meningitis. J Neuroradiol 2014;41:275–277.
. Rheumatoid disease with involvement of the leptomeninges presenting as symptomatic epilepsy. Beitr Pathol 1977;161:194–202.
. Neuromeningeal tuberculosis in a patient with rheumatoid arthritis previously exposed to ineffective etanercept therapy and revealed by infliximab. J Rheumatol 2010;37:471.
. Cryptococcal meningitis in an HIV-negative patient with rheumatoid arthritis treated with rituximab. Rheumatology 2011;50:1725–1727.
. Does etanercept monotherapy enhance the risk of Listeria monocytogenes meningitis? Ann Rheum Dis 2004;63:462–463.